February 14....For Lovers Only (Two Show Times) - Treat your love to a special Valentine's evening…a Cactus Theater love fest! All of the songs will talk about love, but that doesn’t mean they’re slow and laid back…you know, love rocks! Music from the '50s, '60s, '70s, '80s and a special gift for all the ladies. Tickets only $18.00; Cactus Theatre,1812 Buddy Holly Avenue. 7:00 p.m. early show; 9:00 p.m. late show. February 14....Big XII Women's Basketball - Texas Tech Lady Raiders vs. Oklahoma State; United Spirit Arena, 1701 Indiana, 7 p.m.
February 14....Doug Smith Benefit Concert - West Texas piano legend Doug Smith suffered paralysis from a severe back injury in a single-car accident on July 25, 2007. Join an amazing group of West Texas music legends -- including Terry Allen, Jay Boy Adams, Cary Swinney and many more -- as they honor Doug Smith with one night of unforgettable music in Lubbock. Tickets ranging from $23 to $33 available at Select-a-seat outlets, including Ralph's Records, United Supermarkets, Dollar Western Wear and Caviel's Pharmacy. Call (806) 770-2000 or 1-800-735-1288. Civic Center Theater, 1501 Mac Davis Lane, 7:30 p.m.
February 15 (through June 1)...."Dinosaurs Alive!" Film Premiere - The OMNI Theater’s newest giant screen film, narrated by Michael Douglas. Audiences journey with the world’s preeminent paleontologists as they uncover evidence that the descendents of dinosaurs still walk (or fly) among us. From the exotic, trackless expanses and sand dunes of Mongolia’s Gobi Desert to the dramatic sandstone buttes of New Mexico, the film explores some of the greatest dinosaur finds in history. Through the magic of scientifically accurate computer-generated animation, these newly discovered creatures and familiar favorites, will come alive in a big, big way! *Exhibition and Combination tickets include standard Science Spectrum museum admission. Click here to visit the their website. Science Spectrum Museum & OMNI Theater, 2579 S. Loop 289. February 15....Telluride Film Festival - Featuring a two hour performance of short films exposing audiences to adventure, mountaineering, remarkable personalities, and environmental and social messages. $5.00 (GA), Students (Free). Tickets available at the Student Union ticket booth and all Select-A-Seat locations; Texas Tech University Allen Theatre, 7 p.m.
February 15....Fabulous '50s Early Show & '70s Nostalgia Late Show Combo - If you missed the premiere performances of these shows earlier this year, here’s another shot! The Cactus presents the '50s show EARLY and hits of the '70s LATE. The Cactus cast performs the best of these previous shows. Featuring Jeff Bailey, Brandon Gwinn, Billy McClaran, Sheena Fadeyi, Cami Caldwell, Tamara Wallace, Jason Fellers, Jeff McCreight, and Andi Kitten. Tickets $16.50; Cactus Theatre,1812 Buddy Holly Ave. '50s Early show 7:00 p.m.; '70s Late show 9:00 p.m.
February 15, 16...."The Ever After" - by Nathan Hartswick; and "Big Bad" by Alec Strum - Directed by Constance Schmitz-Mousavi and Peter Contreras II. Two fun children's plays in one evening! In "The Ever After," a talk show host invites traditional fairy tale characters who have been estranged for 20 years to reconcile on live television. From Snow White and the Evil Queen to Cinderella and her middle-aged Ugly Stepsisters, this TV show parody asks the question, “Can’t we all just get along?” "Big Bad" has the Big Bad Wolf slapped with a lawsuit by the countless quirky characters he has wronged. Now, the two greatest legal minds in the Enchanted Forest—the Evil Stepmother and the Fairy Godmother—will clash (on live TV, no less!) in a trial that will be remembered forever-after. $8.00 for adults, $6.00 for children, students, and seniors. C.A.T.S. Playhouse 2405 34th Street. Call 792-0501 for reservations or visit www.catsplayhouse.net for more info. limited to the first 200 children who sign up and pay the registration fee. Registration forms can be downloaded at www.spctexans.com or they can be picked up at the SPC Athletic Department office. Credit card payments will also be accepted for the camp. For more information on these special events, contact Darin Allred in the SPC Sports Information office at (806) 894-9611 Ext. 2209. February 16....2nd Annual Ablaze Christian Youth Rally - Local Christian band Zechariah Song will present a free concert at the Fair Theatre in downtown Plainview. Their musical stylings offer a lively mix of rock, classical, swing, praise, and other genres. The youth rally will include evangelist Homer Allison with Battlecry Ministries delivering a special message and Tim Hardage of Rocket Aviation serving as color commentator and emcee. Vocalist and theatrical stand-out Rachel Morgan of Plainview, the Soul Train Puppets from Shallowater, and the Potential Dance Team from Lockney are scheduled. For more info, call Carroll at (806) 292-9786 or Harrell at (806) 296-1139; Fair Theatre, 717 Broadway, Plainview. The box office opens at 6 p.m.. Event takes place from 6:15 p.m. - 9:30 p.m.
February 16....Big XII Men's Basketball - Texas Tech Red Raiders vs. Oklahoma Sooners; United Spirit Arena, 1701 Indiana Avenue, 3 p.m.
February 16...The Sounds of the 80’s Nostalgia Night - The debut of the '80s Nostalgia Night ushers in an exciting collection of music never heard before at the Cactus. We will pay tribute to the music of The Police, Joan Jet, Captain and Tennille, Whitney Houston, Prince, John Cougar, Tommy Tutone, Madonna, Cyndi Lauper and Michael Jackson. Featuring Brandon Gwinn, Cami Caldwell, Billy McClaran, Krisi Clanton, Toby Caldwell and 11-year old Andi Kitten. Tickets $16.50; Cactus Theatre,1812 Buddy Holly Avenue. 7:00 p.m. start for the early show; 9:00 p.m. for the late show. Win Tickets to See the Famous Lipizzaner Stallions on Feb. 21st! This week we will award a select few "Family 4-Packs" (includes FOUR tickets per family!) to our lucky members. To enter the contest, simply email your entry with the words "LIPIZZANER TICKETS" in the subject line of your email. Send your contest entry e-mail to us at: info@lubbockfunclub.com The deadline for receiving your entry is this Sunday night at midnight so get those entries in. Good luck to everyone who enters! February 21....Thursday Night Arts Underground Film Operative Planet Celluloid - LHUCA is celebrating Black History Month with the very first feature film made by an African-America director - Oscar Michaux’s "Within Our Gates" (1920). This historical showing will enlighten and inspire all who attend. Oscar Micheaux directed and wrote this powerful story about racial prejudice and its consequences. This film was put in the national registry in 1992. Admission is free, call 762-8606 for more info. Louise Hopkins Underwood Center for the Arts Firehouse Theater, 511 Avenue K; 7 p.m.
February 23....Flippin' to Make a Difference: Lubbock Lions Club 56th Annual Pancake Festival Fundraiser - A Lubbock tradition of an ‘all you can eat’ menu of light, fluffy pancakes, sausage, orange drink, milk and coffee. Tickets are $4.50 in advance; $5.00 at the door. No charge for children under two years of age. Tickets may be purchased from any Lubbock Lions Club member, or by calling the Lubbock Lions Club at 806-763-4789. Tickets are also available at all Bolton Locations. Lubbock Memorial Civic Center,1501 Mac Davis Lane, 7 a.m. - 8 p.m.
February 26....Lubbock Fun Club Singles (SOS) Bowling Night - Come join our fun-loving singles group (generally the attendeeds are mid-40s plus) for an evening out at the lanes. Last time out, over 30 people made it out for the bowling fun! Cost is only $7.60 per person (correct change please). 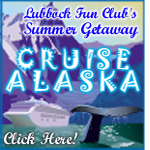 Reservations required by the bowling alley to accomondate the group, so RSVP to: info@lubbockfunclub.com right away. South Plains Lanes, 5150 - 69th Street. 7:00 p.m.
March 2....Lubbock Centennial Opening Ceremonies - Concourse exhibits begin at 5 p.m., and later, local legends including Mac Davis, Joe Ely and Barry Corbin will perform. For more info visit the official website. Event takes place in City Bank Coliseum, adjacent to the Texas Tech University campus, 4th Street and Drive of Champions, 5 p.m.-10 p.m.